Connecticut DOT saved taxpayers a million dollars while completing some vital bridge work more than a month ahead of schedule, allowing the next phase of the Pearl Harbor Memorial Bridge project to move forward earlier than expected. This $136 million project to construct a new Pearl Harbor Memorial Bridge, also known as the Q-bridge in New Haven is one portion of a series of projects included in the I-95 New Haven Harbor Crossing Corridor Improvement Program. The bridge project is part of an overall $2 billion Connecticut DOT program designed to make operational, safety, and capacity improvements to more than 7 miles of I-95 and is Connecticut DOT’s largest highway project ever. 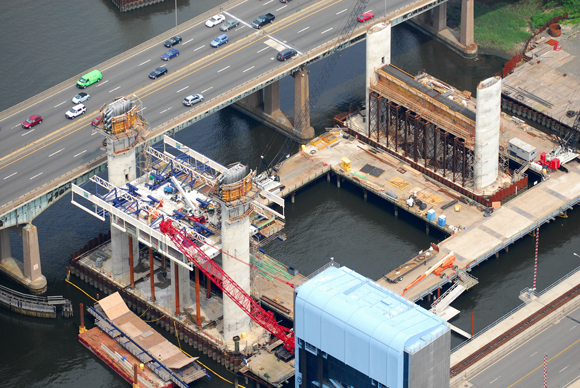 Connecticut DOT decided to first tackle the main span foundations and other marine work in advance of the major bridge contract in order to receive more competitive bids. Work was delayed two months due to a contractor dropping out of the project just before work was to begin. Connecticut DOT re-awarded the contract. Due to what Connecticut DOT called “extraordinary teamwork and cooperation with all stakeholders” through executive team meetings, Connecticut DOT was able to complete the project a month ahead of schedule and $1 million under budget, allowing the state to move forward on the other aspects of the project and building on that success.